Kafkaesque is a word I was first introduced to from an episode of the third season of Breaking Bad when Jesse was attending group therapy. In response to Jesse saying he was afraid to meet the owner of the laundromat everyone was afraid of (Gus Fring), the group leader noted it “sounds kind of Kafkaesque.” It may sound like a weird word but break it down and it describes anything that suggests or relates to Franz Kafka or his writing, especially anything “nightmarishly complex, bizarre, or of illogical quality.” Feelings of senselessness, disorientation, and helplessness usually occur afterward. 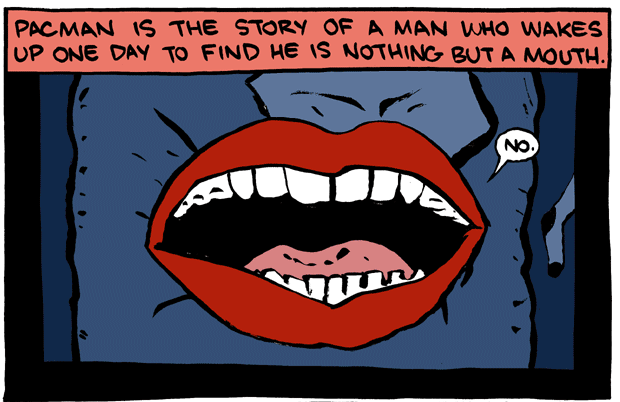 The Kafkaesque of daily blogging. Yikes! I think it’s pronounced “kavka” by the way. Franz Kafka was obviously a brilliant writer to have a word named after himself. His writings often were dark, vague, and frightening in nature, which may be why the term Kafkaesque came into nature to describe situations relating to his writing style. His wish to his friend and publisher, Max Brod, was to have his writings, published and unpublished, burned after his death, but Max saved them anyway until they were confiscated by the Gestapo, some bureaucratic German police force I think, later on – sounds kind of Kafkaesque, huh? The cockroach is often used as a symbolic image of Kafkaesque, in many forms, comical and serious. 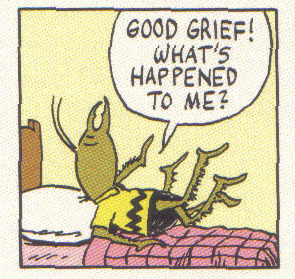 You’re A Cockroach, Charlie Brown! Did Seinfeld have the most Kafkaesque ending ever? Or was it Lost or The Sopranos?